1. Make sure they stay active and strong. It’s vital that your aging loved one keeps their bones healthy and their bodies strong to avoid falling, which is why fitness is so important. Staying fit can be as simple as going for a daily walk or doing exercises to improve balance, such as standing on one leg at a time or making circles with the hips. Lifting weights and climbing stairs are also great additions to an exercise routine, as these activities will strengthen weak legs. If you don’t think your loved one can exercise properly themselves, consider finding an occupational or physical therapist that can help. While being active is a great preventative measure, it can also be a safeguard to avoid broken bones or serious injury if a fall does occur. 2. Keep their space clutter-free. A clean, organized space can make all the difference. The next time you visit your aging parent, help them remove the clutter in their home and clear the walkways. Anything that they could trip over is a hazard. Move old magazines, wires, phone cords, and pet bowls somewhere where they won’t be a potential problem. 3. Adapt their home to fit their needs. Install handrails and grab bars. Handrails should be placed in hallways and on the sides of stairways for extra support. Grab bars are a good addition to bathrooms to help seniors get up from the toilet and safely out of the shower/tub. Make areas non-slip. Replace regular mats in the bathroom with non-slip ones, and make sure rugs or mats throughout the house are skid-proof or secured to the floor. Place items used all the time within reach. Things like food and medicine should always be easy to access. Improve the lighting. Install brighter lights throughout the home and nightlights in the bathroom and bedroom in case your parent gets up at night. Tell them to always have the lights on when they’re up and about. 4. Touch base with the doctor. Your loved one’s doctor can also offer guidance that will help prevent falls. They will check for the physical problems that could contribute to falling, such as poor vision and weak bones. They should also talk to your parent about the medications they’re taking and let them know if they could experience symptoms of vertigo or drowsiness. 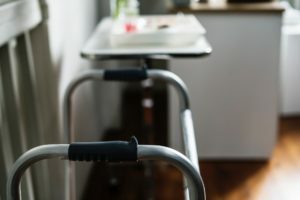 It’s certainly possible for seniors who live alone to successfully implement these practices to help avoid falling, but it can be harder to do as they get older. If you’re worried your loved one is no longer safe in their home, it may be time to consider assisted living. If you’d like to learn more about Paradise Living Centers and what we do to provide a safe and caring environment for our residents, visit our website or call to schedule a tour at (480) 878-4112.